Posted by Bill Mann on Thursday, January 10th, 2013 at 12:27pm. Experienced home sellers in Coastal Delaware know that reaching a sales agreement with a potential buyer can be just the start of the negotiation process. There are often inspection issues to resolve, among other items. One particular negotiation point which can present difficulties for both buyers and sellers is when a home's appraised value falls short of its contracted sales price. Sometimes, this happens because the home's price was inflated. Other times, it's the result of a faulty appraisal. An appraiser will assign your home's value based on comparable properties and recent sale prices. However, some homes -- notably those in foreclosure; sold via short sale; or which were abandoned -- sell at a discount as compared to non-distressed properties. An appraiser may want to ignore these types of comparable homes, or make proper valuation adjustments. The housing market can improve quickly as we've seen in some U.S. markets since 2011. Appraisers, though, may not consider a local market's demand and its rapidly rising prices -- especially after the recent downturn from last decade. If an appraiser is not taking into account such information as multiple offer situations, low local inventory, and days on market, your home's appraised valuation may be affected. 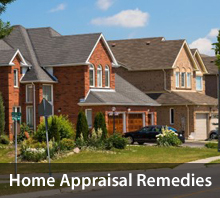 Appraisers operate under strict time guidelines. When an appraisal takes more time than usual, therefore, it's often the result of the appraiser's uncertainty on the home's value. This is a common scenario for unique homes for which comparable properties are scarce. It can also be the case for when an appraiser is unfamiliar with your area. If an appraisal takes an inordinate amount of time to complete, consider asking your REALTOR® to review the figures. 1 Response to "What To Do When Your Home Doesn't Appraise At Its Purchase Price"
Lucy wrote: I am a Realtor working in Austin, Texas. I work with a vriteay of appraisers every day. You will have to take classes, pass a state exam, and apprentice for a licensed appraiser. These requirements vary by state. Check the website for the Real Estate Commission in your state. It will tell you the exact requirements, fees, etc; Real Estate Appraisal can be a very lucrative field, or, you can go broke trying. It is just like real estate sales. Not many people actually make it past the third year. It takes determination, education, networking, and organization. It isn't hard to get a job It is hard to build a business; and that's exactly what you'll be doing. Repeat business is the only way to make money, whether it is from mortgage brokers, bankers, or the government. All these entities require regular appraisals. Even individuals can request an appraisal prior to getting a home improvement loan, or when preparing to sell their home. There are different kinds of appraisals as well. The turn around time for an appraisal is typically 5 days from the time its ordered until it is delivered to the requesting party. Sometimes, it will need to be faster. Flexibility is the key. If I use an appraiser often, I expect he/she to give a faster turn-around if needed. Telling a client no will not grow your business. I've stopped using appraisers for doing that. I send you business; you accomodate my client's needs. This sort of attitude coupled with an expert knowledge of the ever changing market in your area will serve you well. A bad appraisal that under values a property and kills the deal will get you fired in a hurry Do a good job, listen to your clients ( they will give you a script of what they are trying to accomplish) and if you can find the supporting comparable properties to justify the sales price, give them the appraisal they want and need. They have to pay for the house, not you. It amazes me how many appraisers out there think they are your daddy, or that you are borrowing the money from them personally. This is not to say that if someone needs an appraisal for 200,000 and you realistically determine that the house is only worth 125,000 that you should lie or distort the appraisal just to make a sale. They put people in prison for that. Don't ever risk your license for something like that; I'd fire the client and report them to the appropriate authorities instead. I've seen people go to jail, committ suicide, etc; when caught up in these situations. My point is that if you treat people like adults, fairly, equitably, and do the requested work in a timely fashion while maintaining a good attitude, you'll do well in the field. I pick up new clients every week because someone before me did not listen to what the client's needs were. Pay attention to the information they give you; it's important to them. Try to be accomodating; even to the person who is training you. They must be doing something right after all- they are still in business. Start educating yourself about your local market. Take it seriously, go to open houses, look at the local board of Realtors multiple listing website, talk with Realtors, mortgage brokers and start networking with these people. It is amazing how much these people are willing to help newbies . Afterall, our reputations are the only real assett we have. We don't want people in our business that are not competent and ethical. You acn be both. There are a lot of resources available to you. If you have any apptitude for the business and a stick-with-it attitude, you'll do just fine. Go get em tiger. Good luck. Posted on Wednesday, February 6th, 2013 at 3:39am.